The Mackie MR series has long offered an excellent-sounding monitor experience at a fraction of the price of standard studio monitors or even the company’s own HR series. I personally have owned and used the Mackie MR5 MKII monitors for a few years, and absolutely loved them. 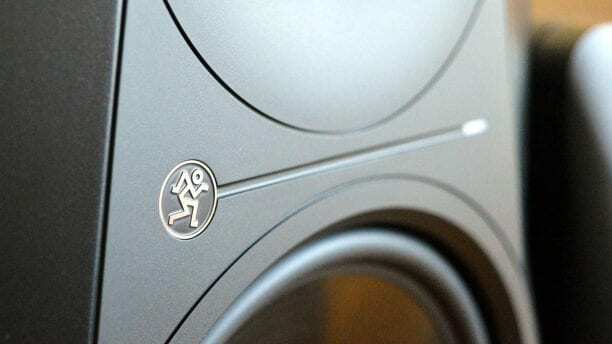 So naturally, when we heard that Mackie was relaunching the MR series with three new offerings — the Mackie MR524, Mackie MR624, and Mackie MR824 — we jumped at the chance to review them. Specifically, we’re reviewing the MR824 here, which is the largest of the bunch and features, as the name suggests, an 8-inch woofer. But how do these monsters sound? And are they worth the $250 each/$500 for a pair price tag? We put them to the test to find out. The first thing you’ll notice about these monitors when you take them out of the box is their design, and they look quite good. 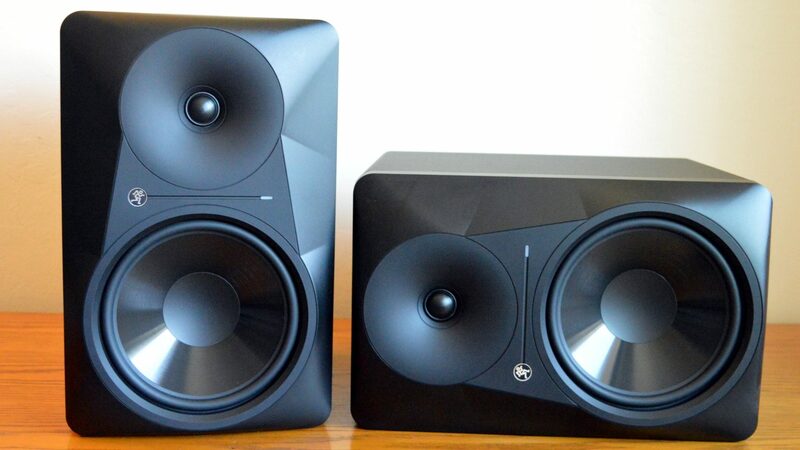 The all-black looks isn’t surprising for a pair of studio monitors, but we liked the angular design of the front of the speakers, which helped give them a much more premium look than their price tag would suggest. In between the tweeter and the woofer, you’ll find a Mackie logo on the left and a small green power indicator on the right. On the back, of course, is where the magic happens. At the top, you’ll find a rear-facing bass port. On the left is where you’ll get your connectivity — a TRS input, underneath which is an XLR input, underneath which is an RCA input. You’ll then get a switch for “acoustic space,” which essentially tunes the frequency to better fit your room and setup, which is a very nice touch. There are three options here — quarter space, with speakers in the corner, half space, with speakers against the wall, and whole space, with speakers away from the wall. For our setup, we switched the speakers to “half space,” but we also tested them out with the other two settings as well. Next up is a high frequency filter, which lets you implement a -2dB, o, or +2dB tuning to the highs. Last but not least is a level knob, a power button, and a power input. In general, the speakers look great and are easy-to-use too. There’s nothing really missing from them, and the addition of the acoustic space switch is a nice one — and something that we’ll explore a little more in the next section. The Mackie MR824 monitors are built to deliver a good listening experience at a fraction of the price of standard studio monitors. But do they deliver? Yup. They do. As the largest speakers in the new MR series, these monitors have a lot to offer in the bass department. 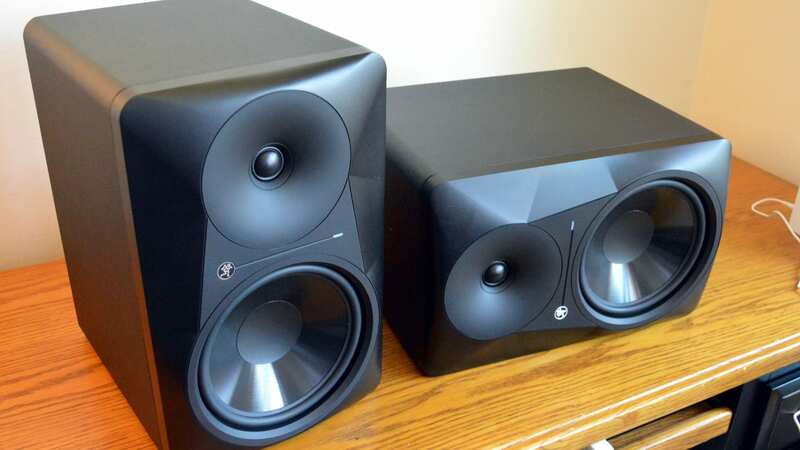 Bass is well-rounded and strong without going over-the-top — which exactly what you would want from a pair of monitors that you’ll likely end up mixing on. The bass extension is quite a lot deeper than our old MR5 MKII speakers, but even when the speakers were mounted closer to the wall, which typically causes the bass to sound overblown, we didn’t experience anything beyond a small bump in the 130-140Hz area — which was actually subdued a little with the acoustic switch set to the right option. That makes a pretty serious case for Mackie’s acoustic switch — we can safely say that it’s not just a gimmick, despite our skepticism when we first got the speakers. The midrange was also pretty well-tuned, and though there were a few bumps in the frequency curve in our setup, it was nothing drastic. The mids in general were very flat, and after a few days using the speakers we became used to their sound in our room and found tuning EQs in the midrange extremely easy during mixing. The high-end on these speakers is crisp and clean. 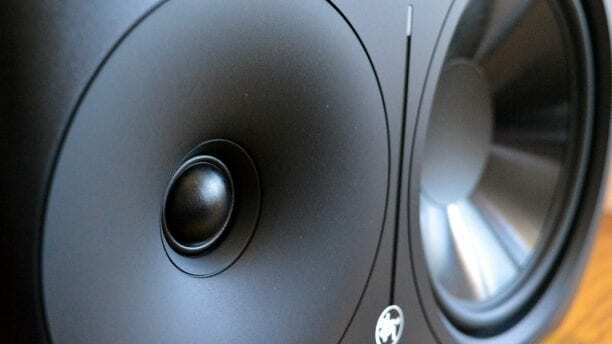 The quoted frequency range on the speakers is quoted at 35Hz – 20kHz, and the high-end certainly seemed to extend high enough for mixing engineers with particularly acute hearing. Vocals and percussion were clean and crisp, without delving into inaccurate territory. 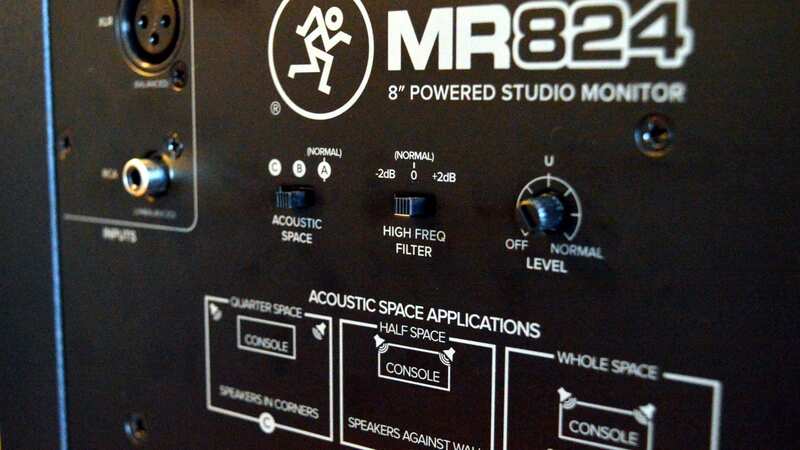 Apart from the frequency range, the Mackie MR824 speakers offered excellent stereo separation — something that you might not expect from a pair of speakers in this price range. They also didn’t distort easily. These babies can get loud, and if you’re buying them for a home studio, you’ll get plenty of volume to anger the neighbors with. Are the Mackie MR824 speakers perfect? No, but for the price they’re pretty close. Mackie has done an excellent job at offering a great-sounding speaker at a low price in the MR series over the years, and the revamped MR series is no different. If you’re looking for an affordable set of monitors for recording, mixing, mastering, or just listening to music in a large room, then these are the ones for you. If your room is a little smaller, we recommend still sticking with the MR series, but perhaps going for the MR524 or MR624’s instead. Check out the links below to buy the Mackie MR824 speakers for yourself. Keep in mind that you’ll probably want to buy two of them — some outlets sell them individually.